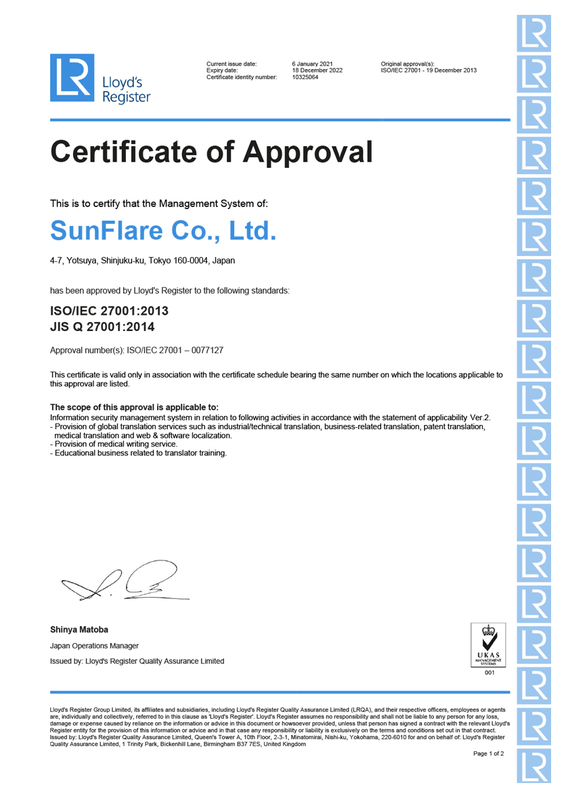 Achievements - About SunFlare - SunFlare Co., Ltd.
SunFlare has been supported by many clients in a wide variety of industries and businesses since its foundation in 1971. We are proud of the number of clients that we have and the volume of transactions that we handle. 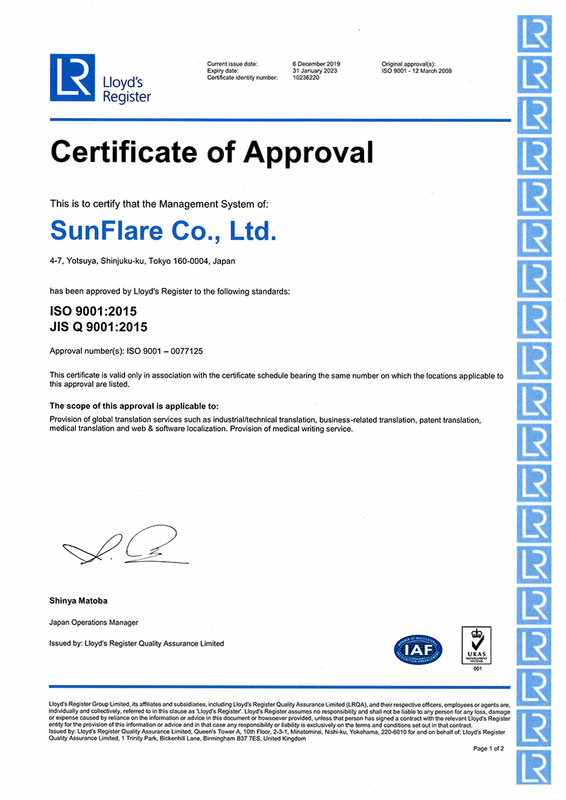 SunFlare provides comprehensive documentation services to ensure that it remains an irreplaceable intellectual partner for its clients. Particulars of applications (patent and utility model rights), drawings, intermediate process documents (notiﬁcations of the reason for refusal, written opinions, written amendments, written response instructions, references, etc. ), priority certiﬁcates, test reports, written requests for correction, etc. Written objections, written answers, counter statements, written requests for trials, written amendments, written opinions, oral proceedings, written decisions, written expert opinions, written complaints, preparatory documents, written answers, written requests for correction, written summaries of statements, records of oral proceedings, discovery-related documents, evidential documents, judgments, various petitions, etc. Joint application agreements, patent licensing agreements, patent transfer agreements, confidentiality agreements, and various other agreements. Invention proposals, patent gazettes, abstracts, ﬁle wrappers, employee invention rules, educational materials related to intellectual properties, presentation materials related to intellectual properties (intellectual property strategy guidelines, etc. ), intellectual property operations manuals and guidelines, documents related to design/trademark rights, patent search requests, patent search reports, various technical documents, etc. Test plans, test reports, GMP-related documents, SOP, manufacturing records, design documents, functional speciﬁcations, DMF, etc. Test plans, test reports, SOP, papers and literature, etc. Clinical trial notiﬁcations, investigator's brochures, protocols, informed consent forms, clinical trial-related SOP and manuals, monitoring reports, case reports, SAE reports, comprehensive clinical trial reports and exhibits thereof, SAE lists, incompatible drug lists, papers to be submitted, documents related to control drug negotiations, statistical analysis plans, DSUR, etc. CTD M1–M5, case narratives, face-to-face advising documents (clinical trial consultations and minutes, etc. ), inquiries and answers, GCP compliance checklists, notiﬁcations of the results for drug GCP ﬁeld investigations, examination reports, etc. CIOMS, literature and scientiﬁc society reports, PSUR, PBRER, RMP, CCDS, SOP, guidance on proper use, etc. Documents related to post-marketing surveillance, documents related to treatment outcome research, post-marketing clinical trials, applications for re-examination, applications for re-evaluation, etc. Papers to be submitted, abstracts for papers, documents to be published by scientiﬁc societies, package inserts, interview forms, outlines of product information, drug information sheets, drug guidelines for patients, etc. UI (software, systems, web service, and applications), help, FAQ, various manuals, release note / ReadMe, tutorial, guidelines, SDK, e-learning content, training materials, bug reports, specifications, design documents, requirement definition, RFP, written proposals, SOP, license agreements, EURA, support agreements, in-game text, and customer support, etc. Market reports, investment reports (macros, bonds, exchange, and shares), investment trust management reports, etc. Notice of convocation of the general meeting of shareholders, documents related to the general meeting of shareholders, minutes of a meeting of the board of officers, brief reports on the settlement of accounts, financial statements, prospectus, business reports, securities reports, financial results briefing materials, annual reports, company brochure, CSR reports, sustainability reports, and ESG reports, etc. RFP, stewardship activity reports, investment product explanation, insurance product brochure, presentation materials, sale and marketing materials, asset management proposals, various financial transaction agreements, press release, articles to be posted on a website, newsletters for clients, seminar materials, audit reports, internal audit, training materials (compliance and personal information management, etc. ), REIT-related documents, accounting standards, insurance conditions, papers, IT system-related documents, and internal rules, etc. Conﬁdentiality agreements, overseas agency or licensing agreements, overseas investment or loan agreements, etc. Negotiation documents, judicial documents and evidence, arbitration documents and evidence, etc. Management principles, codes of ethics, compliance manuals, employee education and training documents, etc. Articles of incorporation and various internal rules, certiﬁcates of registered company matters, documents for general meetings of shareholders or meetings of the board of directors, etc. Due diligence documents (written questions, reports, etc. ), various agreements (share transfer agreements, merger agreements, etc. ), documents to be submitted to government organizations of the relevant country, etc. Standards (ISO, IEC, UL, EN, DIN and others), etc. 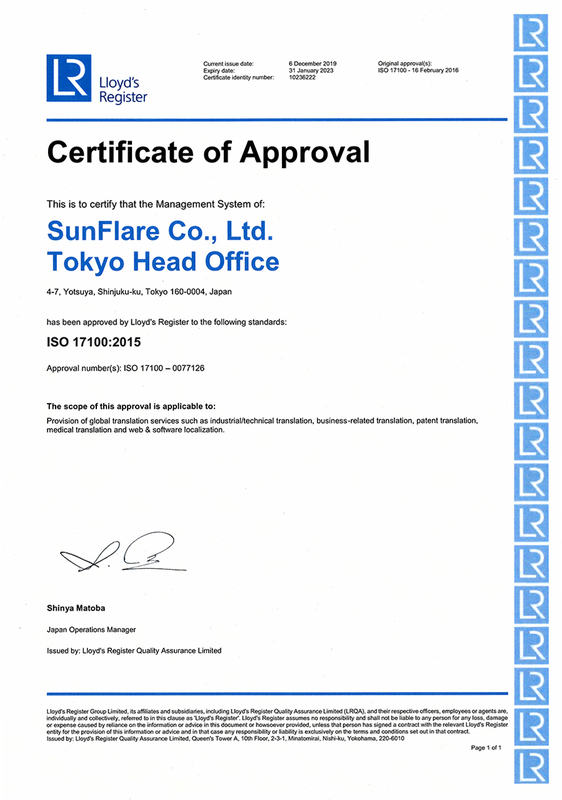 Technical reports, papers, patent speciﬁcations, scientiﬁc magazines, research materials, etc. User manuals, screen UIs, speciﬁcations, drawings, standard operation manuals, inspection procedures, inspection records, etc. Catalogs, press releases, articles, presentation materials, package inserts, SDS, service manuals, investigation reports (defect reports, improvement requests, quality improvement reports, etc. ), agreements, etc. Press releases (news releases), leaﬂets, brochures, catalogs, presentation materials (for commercial negotiations, lectures, or education), SNS, video and audio content, naming research, copyright translations, questionnaire surveys, website content, media articles, etc. Education and training documents on international cooperation projects, survey reports (health and medical services, transportation and traﬃc, agricultural development, information communication technologies, education, natural resources and energy, ﬁsheries, water and sewerage, urban development, environmental management, etc. ), activity reports, ex-post evaluation reports, tender documents (agreements, speciﬁcations, and drawings), tender application documents (technical proposals, sales proposals, registers, ﬁnancial statements, driver certiﬁcates, etc. ), various technical documents for the infrastructure industry (standard speciﬁcations, design standards, procedure manuals, instruction manuals, and drawings), etc. Application forms, STED, package inserts, technical documents, risk management documents, inquiries, outlines of clinical trial equipment, comprehensive clinical trial reports, protocols, defect reports, documents related to post-mark.eting surveillance, quality manuals, SOP, papers, user manuals, audit documents, presentation materials, websites, sales promotion materials, regulations and standards, notices, guidance, education and training materials, etc.